I have a fair bit of time for Tom Ford. What's not to like about a tall, dark, be-sunglassed man in a sharp suit? Or do I mean smooth? Simultaneously smooth and sharp, even. I also have time for some of his fragrances, though the Private Blends are horribly overpriced and tend to stray into "confusing Stella flanker" territory with their collection of musk scents and those ones with "oud" or "wood" or "bois" in the name - not forgetting the various "noir" things. It wouldn't surprise me to find an "Oud Wood Noir" in there too. Now I did cop for a bottle of White Suede on Ebay, a steal at £50, and I'd happily pull a similar stunt on Neroli Portofino if the opportunity arose. I have yet to try Santal Blush, but the omens are good, not least because of its beguiling New-England-clapboard-house-paint-shade name. The standard line is more affordable though, and had I not discovered Black Orchid Voile de Fleur so late in the day, I might have bought that one - you know, in an actual shop. As it is, I traded some Plum with Mals86 for a sizeable decant. I am still not sure about regular Black Orchid, though it gets brownie points for being one of the few perfumes to showcase Quorn. Then White Patchouli is quite ghostly and atmospheric if a little high pitched, and of course we mustn't forget Velvet Gardenia, which deserves its own post if I ever get my hands on a sample again. I remember it as being a tour de force of loucheness and decay that evoked imagery of those dodgy "Eyes Wide Shut"-type parties in The Magus. Notes: violet leaf absolute, orris, sambac jasmine, mandarin, pink peppercorn, benzoin, cedar wood, Haitian vetiver absolute, musk, suede leather. On first applying Violet Blonde I got a strong burst of tingling iris, with violet just behind it, and I was not too sure initially where this was going to go and whether it would be for me. It reminded me of the slightly austere opening of 31 Rue Cambon, which is my least favourite part of that otherwise wonderful scent. 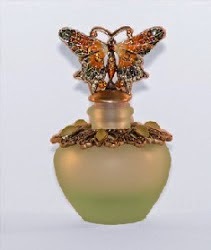 It also made me think I should retry Annick Goutal Heure Exquise, as that was also ringing a small hand bell. There was a goodly amount of pepper, which may be a relative Johnny Come Lately in the grand scheme of perfumery notes, but feels like an old friend these days - or a friend you are forever bumping into in town, certainly. Now the opening tingle must be due to the aldehydes, but they are not as pronounced as in Balenciaga Le Dix, which is the other fragrance that springs to mind if you say "violets" and "aldehydes" to me. Le Dix is like Violet Blonde doing a handstand, with all the aldehydes rushing to its head. I don't have a bottle of Violet Blonde yet, so will have to improvise with Le Dix instead. Let's see if I can coax my bottle to do a handstand too. Okay, we'll settle for the cheat's method in a deckchair, but you get the drift. Lovely as Le Dix is, it is way more of an aldehyde sneezefest to be much of an analogy. For me Le Dix is 80% fizz and 20% "violet and everything else" - and violet may not even be listed, but then again there are no aldheydes listed in Violet Blonde, but we'll pay no attention to that either. Violet Blonde, meanwhile, is 40-20% aldehydes and 60-80% "violet and everything else" (depending on when you catch it in its trajectory). Apart from the creamy woods of the base, the jasmine is the only other thing I can detect, especially as the perfume wears on, and the drydown is spectacular. The texture becomes smooth as satin, and the violet-iris-jasmine trio is very quiet and heartbreakingly pretty. If I were to compare the vibe of the drydown to the beating of a bird's wing then it would have to be the gentle buzz of a humming bird. As opposed to what exactly?, you might well ask, as the needle on your Purple-prose-mograph gives a sudden lurch. Er...the raucous flap of a crow's wing?, I reply, clutching at metaphorical straws and racking my brain for a really loud violet scent. Insolence? One of those muddling "Aimez" ones from Caron? No, my mind's a blank. But anyway, let's skip the bird's wing analogy, violet-themed scent or not, and I'll just stick with smooth as satin for now; with the best will in the world it seems to be impossible to avoid cliches altogether. And what of the violets? In his own review of Violet Blonde, Candy Perfume Boy - who kindly thought to send me this sample - stated that the ones in this fragrance are not like those old-fashioned violet scents worn by the sort of grandma he wouldn't wish to have, namely "the dowdy kind that smells of Parma Violets". This got me thinking back to that childish "sweetie shop" style of violet associated with this retro confectionery line. I do find that the iris (in concert with the aldehydes, jasmine and the vetiver that I don't actually smell in its own right) manages to lift the violet note and makes it much more grown up and not remotely cloying or twee. 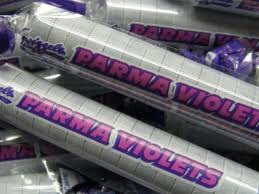 This talk of Parma Violets had piqued my curiosity now, so I had to go and buy a packet, didn't I, to see how they are today. Still made by Swizzels Matlow, in a factory tucked away in the heart of the Peak District, and costing a bargain 30p. They double up nicely as breath fresheners if, like me, you don't chew gum or care for the glacial blast of a Mint Imperial and its ilk. PS If anyone knows of a violet scent with a rough, crow's wing-like feel to it, I would be glad to hear your suggestions! Photo of Violet Blonde bottle from fragrantica.com, photo of Tom Ford from askmen.com, photo of bell from brosamersbells.com, photo of Parma violets from bestbritishsweets.co.uk, photo of hair model from hji.co.uk, Le Dix photo my own. Ooh, nice review! I'm intrigued by violet scents anyway, so I am looking forward to trying VB when I get the chance, though I'm being sensible for once and not buying unsniffed decants. I like a fizzy aldehyde, I like suedey, creamy-woods texture, I like violets. This one sounds so nice. However, I'm not aware of a violet scent with a rougher texture. HATED Insolence, but it was just screechingly loud rather than rough. I thought this was a really lovely and sophisticated scent (although the opening was a bit rough, as you rightly noted). Sadly, I love that silly violet parma smell! So I was a bit disappointed to find Violet Blonde to be not particularly violet-y. But it was really nice, and really shows a maturation from Tom Ford's first, Black Orchid. Sorry for your previous posting problems - I have sorted that out for the time being thanks to this new full page format, which I am testing out with no captcha. It's worth slaying the hydra-like Ugg boot spam that pops up on a daily basis, and Blogger intercepts most of those to give it credit. Unreservedly recommend this to you - I recall your penchant for violets, and this is a beauty. The hunt for the rough violet scent goes on! Yes, the opening was a bit "Whoah! What have we here?" for me, but the drydown makes up for it in slinky spades. And it really isn't awfully violet-y, I agree. Definitely more about the jasmine in the later stages. I commend you for going to the trouble of actually doing the upside-down Le Dix experiment! That is true dedication to our science. Tomorrow there is a 25% off offer at Müller, of Elie Saab sample fame, which I intend to utilize and acquire a small bottle of Violet Blonde. Your review sealed the deal! Thank you! Ok, I'm declaring af Feel Good Scent Conspiracy! They are trying to get us, me, addicted to the stuff that rubs us - me - in all the right ways - and it's working. First I got into AP L'Agent, then there was Strip - then came Prada Candy - and I even gave into EL Sensuous (the EdT - lighter and easier to wear) after some unbecoming scuffling and mindless shaking head in denial. And now I'm wanting to try (possibly own - hence the conspiracy) Velvet Gardenia (I want loucheness!) and Violet Blonde. And once I'm completely lulled into silly zero gravity comfort, They will rule the world - but I'll smell divine. Good thing I have Mme Chanel no. 19to whip me back into shape. And consciousness. Your own luscious review would have tipped you over in the end I am sure, and believe me, I am *this close in asterisks* myself to a FB buy, because I keep giving away my carded samples in a spirit of missionary zeal. Funnily enough, on the day of the post office escapade, I spotted a Slovenian branch of Mueller, but remained focused on the task in hand and didn't go in! Yes, the perfume houses are being particularly tempting this season... Oh, I also have a half bottle of EL Sensuous - I think the correct version - will check. And I may be acquiring VB imminently. I think our two-woman split club still has legs, as it were! Vanessa, I'd love to be kept posted on your VB plans, imminent or future. I'm turning into a comfort addict and fast. Marie, you and me both! In my own case I am not sure if it to do with my age or the onset of autumn, but that is my favourite sort of scent at the moment, particularly with a gourmand angle. Love the picture of Le Dix (and now I want that deckchair - as if perfumes' lemmings weren't enough! :) ). I like, own and wear both Heure Exquise and Violet Blonde and for me the difference in the smell is much more significant than the similarity but the next time I wear each of them I'll pay more attention. 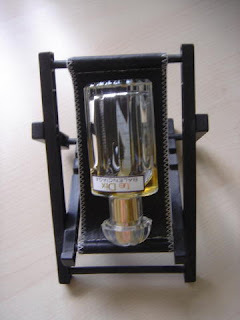 I cannot suggest any of the violet scents that fit your description right now but, if everything goes as planned, I will be doing one of my Single Note Exploration posts the next week and the note is violet - so I'll pay an extra attention to my samples as I re-test them and see if any one fits the bill. The deck chair is fun, isn't it? Got it in a novelty shop in Tenerife and it is meant to hold your mobile phone. I will defer to you on Heure Exquise - it is ages since I smelt it and I don't recall the smoothness or anything like the pretty jasmine note; it was just the opening blast of iris that made me wonder about it again. Look forward to hearing the upshot of your single note exploration - see if you can find any flapping crows! The ADFTA sounds great to me. 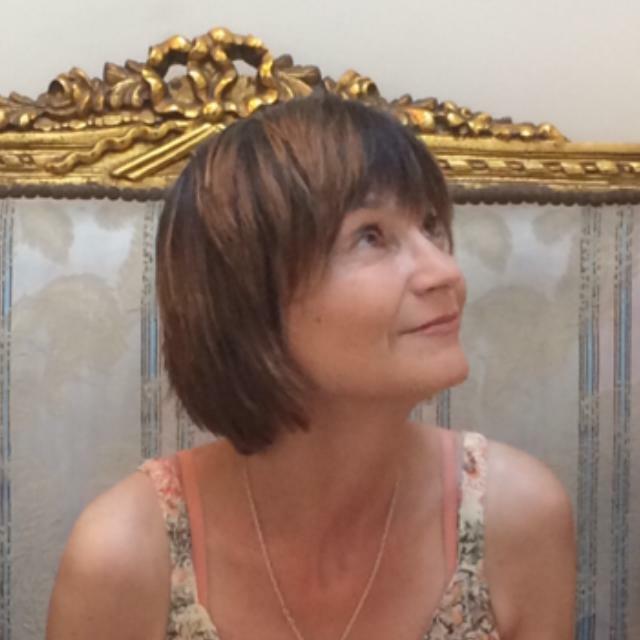 Personlly, I do suspect that it has just a little bit to do with age - but as long as I'm not watching Danish movies from the 1950's and longing for the naturally much happier, rural past where problems were simpler and everyone was nicer, I suppose I'll be OK. And smell really good. Yes, there has got to be an age aspect - remember how Denyse of Graindemusc described Prada Candy as "armour for the 40-something woman in a brutal world". Works a treat for 50-somethings too! You, Candy Perfume Boy and Olfactoria all make this sound like a must-try. The drydown sounds particularly lovely. I wonder if the fact that it's violet leaf absolute, rather than violet flower, means that it's not in Parma Violets territory (thanks for the personal research!). As for rough violets I don't know, but I found Jolie Madame to be "scary violets" that's for sure! You are spot on about Jolie Madame! The violets in that are fierce, as is the leather. If not a crow, I could picture that as a gnarled old golden eagle flapping its wings, hehe. And you may also have a point about the violet leaf toning the violet note down. The iris is more prominent to my nose, though I often find the two notes hard to disentangle. There is so much to enjoy about this review. I especially admire the fact that you took the effort to go buy and taste some Parma Violets, a deed that I couldn't bring myself to do (they make me cringe for some reason). I completely agree with everything you've said about Violet Blonde and you've reaffirmed VB as a major lemming! Hey up, Candy Perfume Boy! Thanks! And I am happy about your birthday money - do have fun deciding what to buy. I must confess that since writing this review, Violet Blonde has become one of less than a handful of FBs I have bought in the last six months. I would be happy to send you a sample if you are not already familiar with VB and would like to try it.